MEXICO CITY, MEXICO--(Marketwired - January 27, 2017) - Hundreds of students, parents and supporters celebrated the opening of a newly renovated facility for Christel House Mexico during ceremonies Friday, January 27, 2017. Located in the historic Tacubaya neighborhood of Mexico City, the new, larger campus will allow expansion through Grade 12 over the next two years. "Pre-first" grade classes will also be added beginning August 2017. Founder and CEO Christel DeHaan shared her excitement for adding high school classrooms at Christel House Mexico during her remarks to the dedication audience: "Our Mexican students will become accountants, engineers, teachers, social workers. . . . The key is to keep them in school, to set high expectations, to insist on excellence and to prepare them as capable and good citizens." The mission of Christel House is to transform the lives of impoverished children around the world -- breaking the cycle of poverty and building self-sufficient, contributing members of society. A focus on academic excellence through a robust K-12 curriculum is combined with a strong character development program to give students the skills and competencies necessary to compete successfully in complex 21st Century society. Much more than a school, Christel House was established in 1998 by Founder and CEO Christel DeHaan, and currently serves over 4,600 impoverished students through seven learning centers -- located in India, Mexico, South Africa and the U.S.A. Christel House students maintain a 99% graduation exam pass rate, and the majority of its graduates go on to pursue higher education. They become productive citizens, and many secure employment with top multinational corporations. Christel House graduates are confident, hardworking, responsible and ethical, with a passion for giving back to their communities and caring for their families. 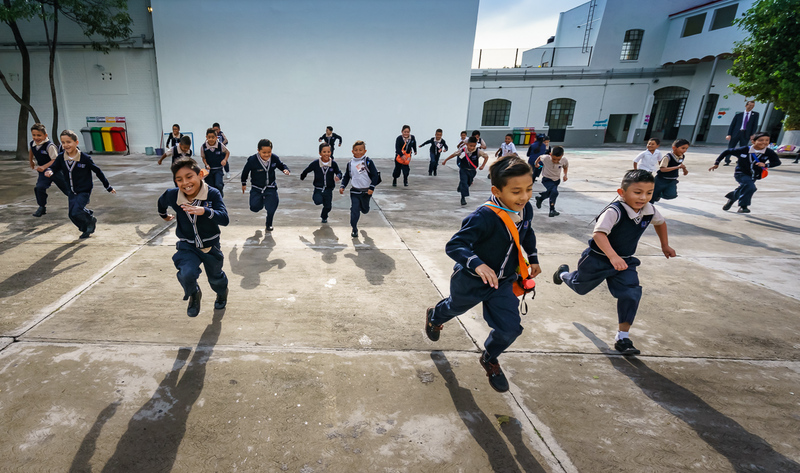 Students of Christel House Mexico celebrate their new school facilities located in the historic Tacubaya neighborhood of Mexico City.